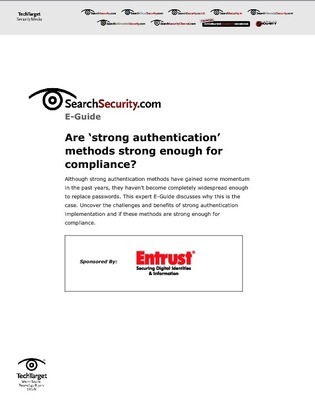 E-Guide: Are 'strong authentication' methods strong enough for compliance? Although strong authentication methods have gained some momentum in the past years, they haven’t become completely widespread enough to replace passwords. This expert E-Guide discusses why this is the case. Uncover the challenges and benefits of strong authentication implementation and if these methods are strong enough for compliance.